Page Street Publishing, 9781624140914, 208pp. Juices and smoothies are packed with the vitamins and nutrients you need to nourish your body. 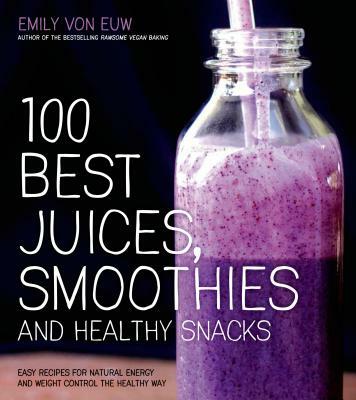 And Emily von Euw, creator of thisrawsomeveganlife.com, has recipes that are so delicious you'll be drinking to your health every day. • Lime and Apple Aura? Each sip will boost your metabolism, detox your body, strengthen your immune system and help you get your daily-recommended intake of fruits and vegetables. Plus, swapping in some of these healthy drinks and quick snacks will help control your weight and save you time in the kitchen. With recipes that are not only good for you and easy to make, but tasty and portable as well, you'll be clinging to this healthy living companion with both hands. Emily von Euw is the creator of the blog This Rawsome Vegan Life and author of the bestselling book Rawsome Vegan Baking. Her recipes have been featured in Vegetarian Times, Chickpea magazine and on Shape.com. She lives in British Columbia, Canada.